This module allows organizing documents into categories and publish them literally anywhere on your site. Product manuals, archives, agreements, contracts, downloadable images, any type of files, and even symbolic links to documents located on other server. Now all this is easy with Attachments Anywhere module. 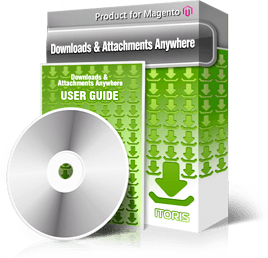 Create downloadable files for product pages, attachments to CMS pages, static blocks or category pages. Upload documents for certain cusomers or entire customer groups. Limit downloads on time (from-to dates). Make product attachments available only to customers purchased the product within the allowed period of time (days, weeks, months). Files can be organized in categories or displayed all together, easily reordered, published or unpublished. Mass actions are available. For example, you can attach and detach files to multiple products at once! It is possible to show large or small file icons. Customers can download files in their account. There are 2 security modes available depending on the files you publish - static links indexed by search engines, and secure links generated for each download individually. In secure mode nobody will be able to share private links with others. If you have a lot of files a special page will give you the list of all objects the files attached to - products, customers, CMS, etc. So you won't miss any file and will be sure all attachments are linked correctly.